What attracted me to this book were the words “social space” (it was work-motivated, but turns out the book’s topic of “social space” isn’t quite what I had in mind). What made me stay with the book was a chapter featuring excerpts of emails, about the organising of a forum (p119. “Party Politics: Dealing with Disagreement”). The point of contention was about the way the forum was organised, the lack of consensus, also the invitation of a particular personality (who’d then run foul of the political incumbents). That particular chapter started to read like a mini-drama! It left me the impression that if you’d ever tried to achieve anything by consensus, it’s reassuring that consensus-building is inherently difficult. Also interesting to be able to read, as a matter of public record, how decisions were made, or lack of. This book is, in many ways, a telling of the story about The Working Committee (TWC), which was positioned as a year-long project (1998 – 1999). The book gives was published in 2001. Truly, if not for a serentipitious browse among the shelves, I’d never have discovered such a gem. At that time TWC was unique, as no such attempts have been made to form such groups since Independence. Contrast with today where we have events like barcampSG and Interesthink.com and countless other social media groups (or “pre-Web 2.0.” groups in Yahoogroups and Googlegroups). Reading the book now, I’d say the grassroots civic society is here. It has a shape. I also think it’s part of the natural development and maturity of a society. You cannot one day say “time we have more civil societies”. p.8/ 9, Tay Kheng Soon writes: “The more educated think more, feel more. This is where civil society comes in”. Other supporting chapters give different individual perspectives of the TWC conflicts. I thought that’s very commendable by the editors, to include differing views. [I agree. Face-to-face meetings are important. But the internet, social networking specifically, increases the probability of connections among individuals.] Tan’s essay also gives insights to Sintercom. Book also includes origins of societies like Family Planning Association, AWARE, Nature Society (Singapore), The Necessary Stage. 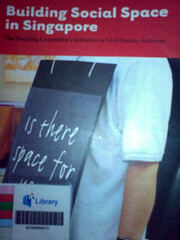 p. 147 Cherian George suggests the NGOs are already practicing civil societies. Also uses the road and transportation system as analogy. A Singaporean’s account of how he coped with his wife’s depression and schizophrenia, as well as his own subsequent bouts with depression. It also describes their courtship, the initial objections to their inter-racial romance, and other difficulties that they experienced along the way. “… just like AIDS victims, mental patients too should not be isolated, shunned and discriminated against. I hope Loving a Schizophrenic, seen through the eyes of Daniel, will demystify mental illness and raise greater awareness of the needs of those who struggle with their minds’ demons. 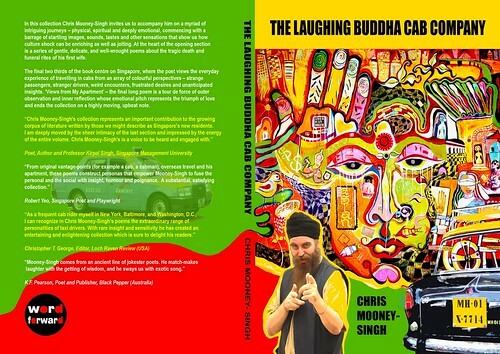 Fictional account (or semi-fictional perhaps) of the conversations and thoughts of a group of Singaporean cabbies. The book is unique in that it’s one of the very few books that focuses on this particular trade in Singapore. Easy to read. Not terribly exciting in terms of plot or Characterisations, but maybe that’s consistent with the lives of most people. High Browse Online review here. 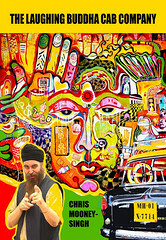 Interestingly, there’s a UK web trade magazine called Taxi Talk. The book lists Dr. Tan as the Assistant Professor at the National Institute of Education (NIE) — the institution that trains teachers for the Ministry of Education in Singapore. This book seemed to be as much about the horses, as the unique people who ride them. It isn’t about the therapeutic effects of riding, for people with disabilities (that is very much self-evident from the stories). 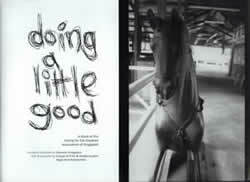 It didn’t come across as a book on the Riding for the Disabled Association of Singapore (RDA). It’s about the people with disabilities, the horses, and the RDA instructors and volunteers. But mostly it’s about the riders and the horses. You’re quickly introduced to the riders first — the children and teens with various disabilities. You learn their names. You see their individual faces in the photos. Some of them look at the camera. Some appear caught up in their thoughts and quite moments. You learn of their conditions (so many types). You read comments from their caregivers and parents. Often there is little or no direct quotes from the riders themselves. The entries are concise and to the point. The various disabilities are stated factually. You get to know the horses. Some of them come with a past, having retired or left the horse racing circuit due to injuries or disabilities. Like Kublai Khan, the gelding who suffers nose bleeds due to his blood pressure and dry coat; Kimba, who grew too large for polo; Annie the pony with a scarred hind leg; Tesoro the ex-race horse with damaged joints and ligaments. If this book is about “what it means to do a little good”, then I think it has succeeded. 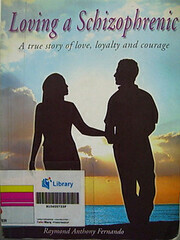 Check NLB Catalogue for item availabilty (copy and paste the ISBN “9812564144” under Keyword search). Oh, there’s nothing risque, and no state secrets (Singapore’s or from other countries) have been compromised. What I found pleasantly surprising was how palatable this book was. I enjoyed each of the 53 articles — personal stories, really — authored by Singapore’s Presidents, Ministers, Permanent Secretaries, Women Ambassadors, First Generation Diplomats, Second Generation Diplomats, and Non-Resident Ambassadors. I recognise quite a number of names — the late President Wee Kim Wee, and President S.R. Nathan; the late S. Rajaratnam; there’s S. Dhanabalan, Wong Kan Seng, S. Jayakumar, Kishore Mahbubani, Tan Chin Nam, Bilahari Kausikan, Chan Heng Chee, Winston Choo, Tommy Koh, Barry Desker, Jacky Foo, Walter Woon — and lots more that I don’t. BTW, each entry has a photograph of the authors. The stories gives an insight into how Singapore’s diplomatic corps operates. But it’s more than that. It’s a telling of the diplomatic corps’ culture written from personal perspectives. It’s very “human”, and there are many things shared that few might be aware. There’s many many more. To properly introduce and highlight each of the stories would require individual posts for all 53 of them. I heard Tommy Koh mention (at the READ! Singapore 2006 closing ceremony) that this book was considered very successful in terms of the number of copies sold — by Singapore’s standards. I can appreciate why.